Simple to use, not necessarily as advanced as other streaming devices, but for a lot of people, the ARCHOS 35 Home Connect would make a really good starting point to go all-the-way digital. 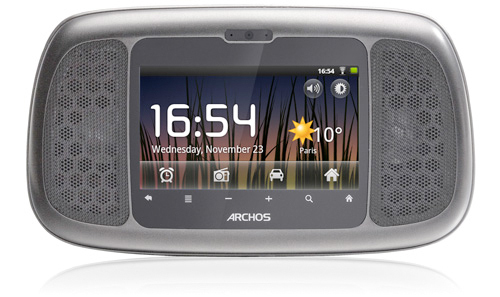 Before I looked on the ARCHOS website I came to the conclusion that the ARCHOS 35 Home Connect is intended for your bedside table, with stand-out features such as traffic, weather, nature sounds and infinite alarm settings. When I looked on the Archos website this is precisely their big sell. Which is no bad thing! Powered by Android, you can set 100’s of different alarms to suit your daily activities, the player will alert you with two powerful little speakers using built-in sounds, your uploaded MP3’s, or streaming digital radio via your home Wi-Fi network, plus, without getting out of bed you can find out what the weather is like, or what traffic lies ahead for your journey to work at the press of a single button. The design of the Archos is a little archaic and setting it up is a bit fiddly, not complicated, but I found the touchpad a bit small and unresponsive. The 3.5” screen is a good size however, and as I already mentioned the speakers are good quality, so I would say, once set up it should be left alone to do its thing. As an Android powered device you do have the option to download lots more applications, but I think Archos have pitched this just right, I would leave the other apps to your laptop, PC or tablet to tackle. Games for example, Skype, Internet browsing or email, I just can’t see the Home Connect winning over these more dedicated devices, but at just £51 right now you can definitely make room for one more! 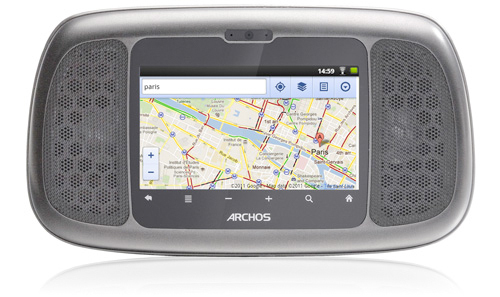 I give the ARCHOS 35 Home Connect a good GnG rating!